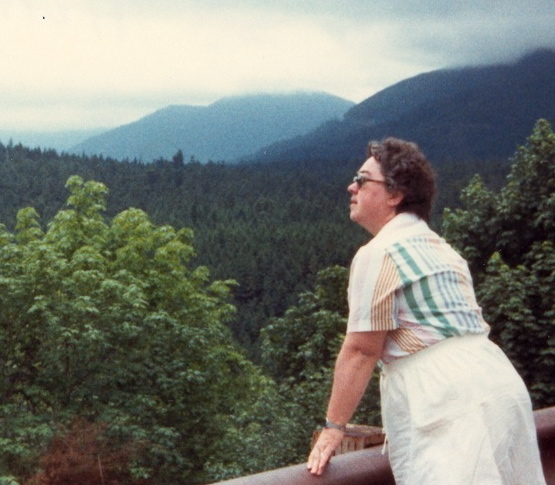 Posted on Mon, Apr 5, 2010 : 10 p.m.
1984 photo of my mother, Barbara Feldt, Hurricane Ridge, the Olympic Peninsula, Washington State. How did you get interested in plants? I’ve been asked countless times to provide a history and a context to my passion for wild food and using natural home made herbal remedies. There are many converging paths that place me here, writing about wild foods, spending as much time as I can in the woods and wild places. The first and primary path is my mom’s. Today, April 5, is the 17th anniversary of her death. A fitting time to sit for some moments and both honor and contemplate her memory and what she passed on to me. My second grade teacher, Mrs. Avery, encouraged my interest in nature. She gifted me with a book at the end of that year, “Cornell Nature-Study Leaflets”, published in 1904. She affirmed what my mother had already instilled, enthusiasm for the plants and for growing things. 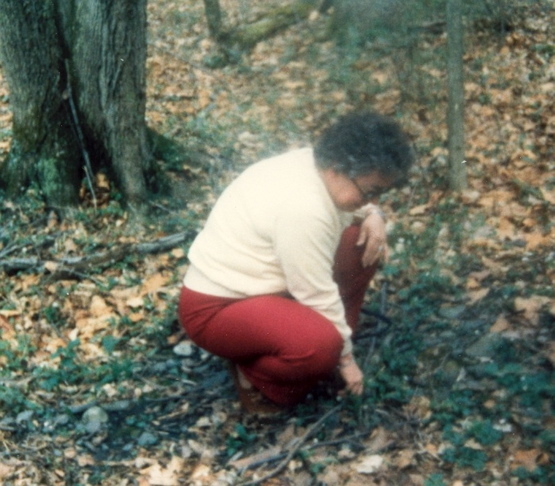 Barbara Feldt enjoying the wild flower preserve she helped establish at Van Natta's Dam, Ithaca, New York, 1985. When I was a Girl Scout Brownie, in about third grade, my mother would take us on spring wildflower walks. I got to know the individual plants well enough that I was soon giving wildflower walks as well, from age 8 until I was about 12. We had moved to Ithaca, N.Y. before coming back to Ann Arbor, and she was largely responsible for the formal commitment to a nature preserve near Van Natta’s Dam in Ithaca. Some of her cremains are scattered there. My lasting mark on the area was the successful campaign to keep an area adjacent to our school, Belle Sherman Elementary, in a wild state. We called our movement “Strawberry Fields Forever”. I led a petition drive to head off “improvements” to the area (baseball fields, picnic areas and grills) so that the wild butterflies, snakes, salamanders and of course the plants, could continue to thrive and grow and be enjoyed by the local kids. With the petition drive, the name was formally accepted as “Strawberry Fields” and remains so today. Of course the Beatles were popular at that time, and I don’t mean the bugs. That experience, as a 10 year old, had a lasting impact in my confidence to be able to create positive change in the world. Every spring for many years to come, I would join my mother in the woods to look for wildflowers. It was her favorite time of year. As she became more disabled from congestive heart failure. we would figure out how to get her into the woods come spring, even if it was finding a place where the wildflowers could be viewed from a wheelchair. By the time she was my current age, my mother was struggling with heart disease and diabetes. Getting out to the woods was an effort, and doing much work in the garden was no longer an option. I’m grateful that part of her legacy has not afflicted me, and I can spend as much time as I can hiking and experiencing nature. While she encouraged my studies in alternative health care and natural healing, she wasn’t one for using many herbal remedies, although Motherwort and Echinacea tinctures saved her from more intrusive medications on multiple occasions. But she always grew things, enjoyed her gardens and felt connected to the plant spirits. That constancy of connection with the plants became part of my world. In the early ‘80s I lived with three aspiring midwives, and we encouraged each other to forgo modern medicine and learn the plants and herbal remedies by using them ourselves. More intensive self study, followed by a two year apprenticeship with Susun S. Weed in Woodstock N.Y., was the convergence of these many paths, and began my teaching as an herbalist as well as integrating that knowledge into my practice as a holistic health practitioner. My mother enjoyed Susun Weed, and we always made sure Susun spent time with her when she was in town, which was about four times back then. There is one story I enjoy telling, as it says so much about the plants and my mother’s openness to their energy. The three of us, Susun, my mother and myself, were strolling around my mom’s yard, seeing what was growing. We came upon a white clover, also called sweet clover, Melilotus vulgaris. Susun began telling us about how it can be used dried for its pleasant aroma. As she began talking about the medicinal properties, she mentioned that it is a blood thinner, similar to the drug Coumadin. She wanted to pick some and started looking around to find additional plants. But there were none, only a single pant growing up against the foundation of my parent’s house. My mother heard the word “Coumadin” and told us that this was the drug that her doctor wanted her to start using. She was uncertain, as it is also a rat killer, a powerful anti-coagulant and blood thinner. Then we all noted the location of the plant. The single plant was as close to where my mother’s bed was, it was growing just on the other side of the wall where she slept. There was no way for it to be growing in closer proximity to her, unless it would be growing inside and under her bed. She recalled what Susun had said about the plants you need finding their way into your yard. It would be dangerous to use a plant in place of the Coumadin pill, since using precise amounts and not overdosing is critical. But my mom felt that this plant was giving her the message, try the Coumadin as a drug. So she made her decision, and indeed it was a helpful drug for her to use for the next many years. My mom died at the age of 60, 13 years after her first heart attack. The love and connection to the natural world is something she shared with me, and it is that legacy that also may protect me from what killed her. Daily walks in the woods and even around town that focus on looking for interesting bits of nature keep my heart strong. A devotion to dark green leafy vegetables, my own vegetable garden and growing a lot of what I eat nourishes me in ways she never attained. Enjoying clean air, and having never smoked as she did for 30 years until her heart attack, will certainly greatly increase my chances of living a long life. But today, and so many days, I so wish I could be sharing what I’ve learned with her, having her support and enthusiasm. I wish she knew where my writing and teaching about plants, medicine and foraging have taken me. She was also a great editor, something every writer cherishes. I could use that help. Losing a parent so young to chronic illness and then death robs us of that special adult time together, a time to really be able to appreciate who and what these people are who so influenced every aspect of our early lives. I wish I had that time now with my mom. But today is dedicated to her memory, and I will spend most of it outdoors, enjoying the spring wild flowers, savoring her legacy and being grateful for her early inspiration that has resulted in such appreciation and involvement with what grows in nature. I was born in Ann Arbor, and have worked here as a local Holistic Health Practitioner, teacher and writer for over 30 years. My mother's mother and father both attended the University of Michigan, my grandmother was in nursing, and met my grandfather here. My parents both worked for the UM, my dad Allan Feldt is a professor Emeritus, my mother worked at The Affirmative Action Office. For more on early nursing school history (1920s) and Saugatuck Michigan, and early care of premature babies, click here for a 15 minute interview with my grandmother, part of it with my mother.